"You gotta have a creative strategy behind each product you design." I think what struck me in my client’s office is that it has been ten years since I first learned the value of having a creative strategy and it remains among the best advice I've ever received as a handbag designer. However, it never ceases to amaze me how often designers are misperceived, even by our own non-design interdepartmental colleagues, as only drawing to our heart’s content until someone else reigns us in. The reality of design, however, is much different: Good designers understand that design is a business and designs need to sell at the end of the day. So you better believe that designs need to be supported by a sound strategy that will increase the chance of selling! As such, this post is perhaps targeted to aspiring handbag designers, as well as anyone considering hiring one. As a working designer in the retail world, it is vital that you create products that not only maintain as much creative integrity as possible, but also meets the demands of the market. This balancing act is what defines a successful designer from an unsuccessful one, no matter if you have talent or not. You may be a super talented designer from Central Saint Martin, but if you can't balance what your heart desires with what's needed by consumers, then it will be ever so challenging to remain employable, let alone relevant to the market that is driven by consumers. 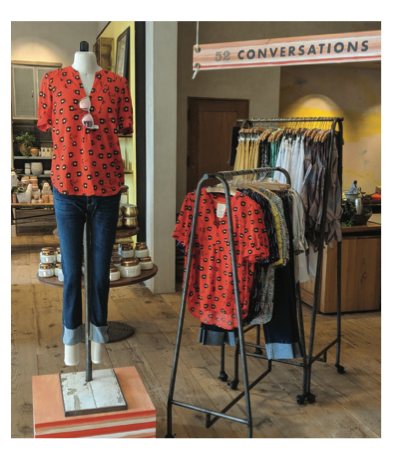 Anthropologie 52 Conversational Limited Edition. Conversational Print is still very much the focus. To be a good designer, you must learn to design with strategic purpose and execution in mind to reach whatever sales/creative/retail goals are set. For example, I always start my own design process by asking myself a barrage of initial questions: "Who are my customers? Suburban moms or city gals or a blend of both? How do they dress? How much are they willing to spend? How do they live their lives?" If this sounds like research that only marketing and sales folks should do, you’re mistaken. A good designer will take the initiative to figure this out for him/herself. Designers need to stay relevant and the only way to do so is to know what’s relevant to your target market. Let’s continue with the suburban moms for instance. They often need to literally shoulder a myriad of responsibilities and virtually fit the world into their bags, so I always include a TRUE TOTE in my line ups. Nothing too complicated but with enough pockets for functionality and accessibility. From there I’ll ask myself a critical follow-up question: “Am I designing this tote to faithfully translate my brand's DNA to our consumers while adding some trending elements to it?” If the tote is beautiful but looks nothing like your brand's DNA, then you are a one-off designer who can't create products that maintain a consistent brand look. Saks Fifth Avenue: 80's Back with animal prints and bold colors! A. Are there any special holidays in this season like Mother’s Day or Back-to-School? If yes, most likely your customers will expect you to sell at a discount, which means you must design that tote in such a way that you can afford to sell it at the expected discount without hurting your margin. C. Obviously materials and color ways can be determined by asking this question as well. And then there are the questions I ask myself when samples come in: "Will they sit well together?" Color wise, style wise, and even material wise, is there a cohesive theme created by these products sitting together in a store? Any eye sore design I should just drop? Any crazy price point I should just give up? This is mostly a collaborative process when you need to sit down and discuss with Merchandising, Sales & Buying teams to get a more balance POV. But even after all that preplanning and effort on your part, don't be surprised when you still need to defend your designs and explain your strategy behind each product: "No, I can't use that trendy peacock blue on the tote because green never sells well for our customers and peacock blue has too much green. Instead, I chose a warm lake blue to compensate for the missing peacock blue." " I made the wristlet front panel die-cut using the same die-cut mold as the crossbody so that combined styles' quantity will off-set the die cut mold cost." A successful designer designs to ensure a successful transaction!